The night was electric with ten Scout.com National Top 100 players in attendance. There were 23 attendees that were ranked four or five stars. The wide receiver list included a mind boggling nine four and five star players competing against one another to see who might be the best. Out of all that, one player all but stole the show. Wide receiver Terrance Toliver of Hempstead (TX) blew by defensive backs and just made everything look easy for himself at Friday Night Lights at the University of Florida. At 6-4 and 193 pounds, Toliver physically overmatched all the cornerbacks at the camp. The receiver group was unreal as a whole and a number of them turned in outstanding performances, but Toliver cerated the most physical mismatches of the night. Toliver was impressed with the atmosphere and the competition, even if it wasn’t quite enough to make him sweat. He also noticed the guys throwing the ball and he really thought one quarterback stood out. Some of the Florida Gator football players made it out to watch the camp. They came away impressed. Toliver met Percy Harvin, last year’s top wide receiver among high school recruits. He was kind of surprised to see him on the field. 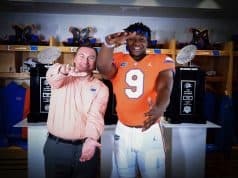 It was a long weekend in Gainesville for Toliver who flew in early Friday and left early Monday. 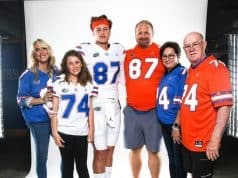 The Gators also held their fourth Junior Day of the recruiting season during that time. When asking for a list of favorites he named four schools but isn’t ready to limit it to those four. “There isn’t a top five, but Florida, Miami, LSU, and Oklahoma kind of stand out,” he said. He has started to set the criteria for his choice in college programs. As far as the lucky school that Toliver chooses, he has a lot to offer and it all started at a very young age. The first time he goes to cut the list comes very shortly. 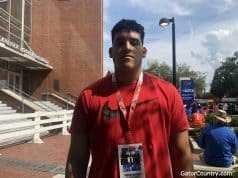 He plans on having all of his official visits settled in the next couple of weeks. Stay tuned in early August for this one.